Eyewear is very glad to welcome American poet Don Share (pictured) this exceptionally warm Friday in London, and to feature a new poem by him. Share grew up in Memphis, Tennessee. He is Senior Editor of Poetry in Chicago. 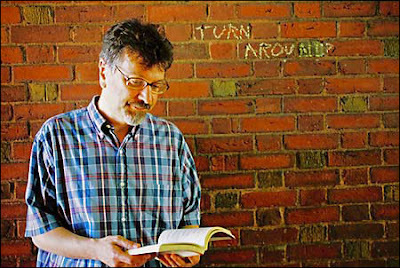 He was previously Curator of the Poetry Room at Harvard University, and Poetry Editor of Harvard Review and Partisan Review. Squandermania is his most recent book of poems, three poems from which were nominated for a Pushcart Prize. His earlier book, Union, was a finalist for the Boston Globe/PEN New England Winship Award for outstanding book. His other books include Seneca in English and I Have Lots of Heart, translations of Miguel Hernandez which received the Times Literary Supplement Translation Prize. His critical edition of the poems of Basil Bunting is forthcoming from Faber and Faber. pushed aside on a stark china plate. The man upstairs was not happy. stringent enough to shrive a cactus. on what I thought was ceremony. or eat my ham sandwich. I was filled, thank God, with genuine salt. I love the phrase "to shrive a cactus" and the telling, important word "genuine."